With the release of HelpSmith 5, we introduced an improved approach to managing images and video files in a help project. In this post we would like to review the key benefits of a single media repository and to talk about the new possibilities that we implemented. HelpSmith automatically copies all graphics and video files that you insert into your help project to a single media repository which is stored in a sub-folder located in the same directory as your HSM project file. On the Project tab, in the Project group, click Project Objects. In the drop-down menu, click Media Repository. You can re-use the same image or video in more than one help topic. In case you need to update an image (for example, a screenshot), you do not have to find and edit all of the help topics where it’s located. Instead, you can simply replace the screenshot directly in the Project Media tool. You do not have to worry about the original location of the media files on the disk. Since all the files are automatically copied into the repository folder, you will not lose any file even if the source file is deleted. You can easily copy or move your help project to another computer or storage device since all of the included files are stored in one folder (named like YourProjectName_files) along with the HSM project file. In HelpSmith 5 we enhanced the ability of the product to handle large amount of graphics while using minimal system resources. Practically, the new approach has eliminated the “out of memory” issue that could be met on help projects with very big number of images with common amount of 2-4 GBs or more. Also, when you save a big help project, it now takes only seconds since HelpSmith saves only new or modified images while earlier versions re-saved all image files included into the help project. 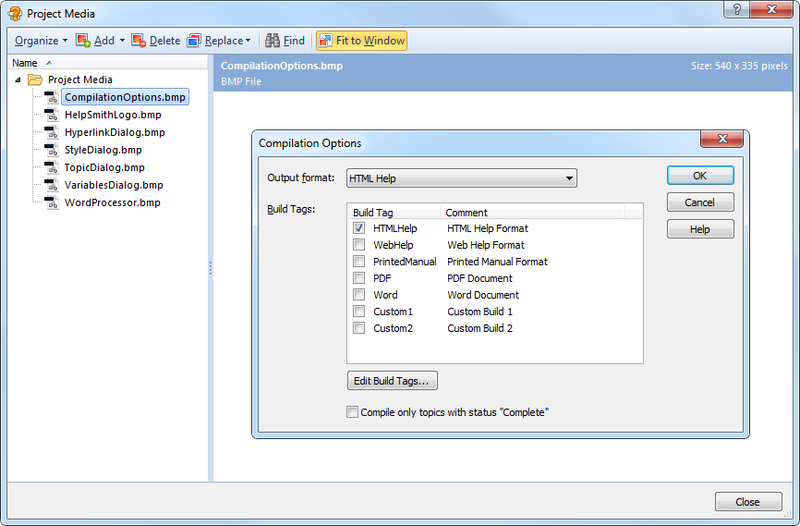 In addition, there is a number of improvements that provides more comfortable working with the Project Media tool such as drag-n-drop support, automatic sorting of files and folders, the possibility to view an image in its actual size, the possibility to search for files by name directly in the Project Media tool, and also automatic deletion of removed files from the disk. For more details on working with Pictures and Video in HelpSmith, you can refer to the HelpSmith Manual by clicking this link.